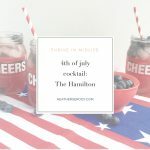 I've served my friends different versions of this fourth of July cocktail for years. It's always a hit, 'cause it's red, white & blue. Any patriotically themed vodka cocktail has to be made with Tito's American-made craft vodka. It's also got yummy tart cherry juice, which is more yummy than tart. Seriously, what's more American than cherries? This recipe contains fruit juice so it's obviously not strictly keto-approved, however you can use Cheribundi stevia-sweetened cherry juice which means you have no added sugar in this juice that will impact your carb count, just the natural sugars found in the cherries. I figured I'd call it the Hamilton because The Hamilton monument stands among the cherry trees directly behind the Metropolitan Museum of Art along Central Park’s East Drive at 83rd Street. So there's that, too. 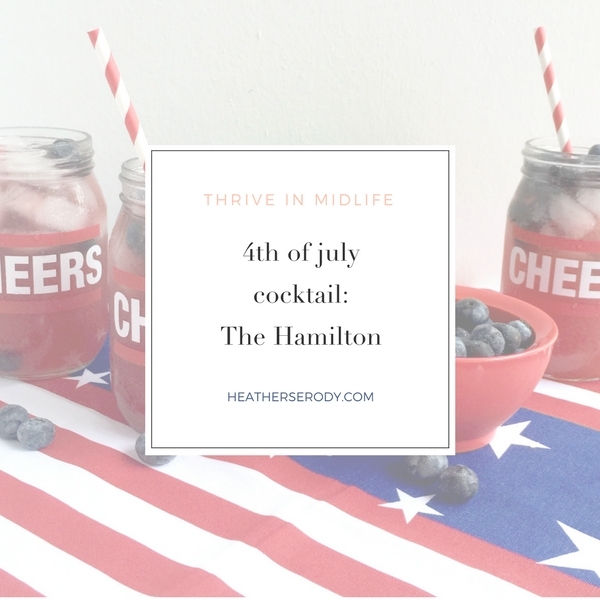 To make The Hamilton, you'll shake up some Tito's over ice in your Boston style shaker along with fresh lime juice, tart cherry juice, and club soda or sparkling water with ice. Serve in a highball glass and garnish with frozen blueberries. If you want to get at some of that blueberry juice, muddle the blueberries before you add them. If you like your cocktail stronger just omit the sparkling water. tart cherry juice – contains one of the most powerful antioxidants that exists (quercetin), anti-inflammatory compounds, helps you sleep better, protects muscle damage and aids recovery after working out. fresh lime juice – contains high levels of vitamin C and flavonol glycosides, which offer anticancer, antibiotic, and antioxidant benefits. whole blueberries – offer antioxidant protection and have been associated with enhanced cognitive performance, and have a low glycemic index impact on blood-sugar levels. Titos Vodka – Yes, I know that vodka is not a superfood. But- if you're going to indulge at least buy the highest quality vodka that you can. I polled my friends about which vodka is the best-tasting for mixing drinks, and I guess I've been living under a rock because it turns out that vodka drinkers love Tito's. Tito's is handcrafted small-batch vodka made from corn in Austin, Texas. Tito's won the double gold medal at the World Spirits Competition, which means it was a unanimous judge's choice for taste. For that quality, Tito's is reasonably priced, too. Save the Grey Goose for martini night. This is the perfect cocktail for a Fourth of July barbecue because it's not too strong, so you can feel fine about indulging in the afternoon. If like a stronger cocktail, then decrease the amount of club soda to your taste. The Hamilton multiples well if you want to make up a pitcher ahead of time to make your life easier. Make the extra effort to freeze fresh organic blueberries ahead of time, because pre-frozen blueberries just don't compare. Happy Fourth of July weekend! Pour vodka , lime juice, club soda, and and cherry juice over the ice. Cover and shake a few times. Pour cocktail into your highball glass and top with frozen blueberries. Serve with a patriotic straw.